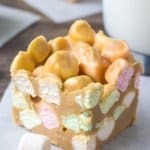 Confetti squares are a super easy, 4 ingredient, no bake recipe. Also known as peanut butter marshmallow squares - these are soft, chewy, peanut butter-y and deliciously sweet! Line an 8x8 or 9x9 inch pan with aluminium foil and lightly grease. In a medium saucepan over low heat melt together the butter, peanut butter & butterscotch chips. Stir occasionally until the mixture is smooth. Remove from the heat and allow to cool to room temperature. Pour the batter into the prepared pan and set in the fridge to harden (about 1-2 hours).